Court Appointed Special Advocates (CASA) of Kern County speaks for abused and neglected children in the juvenile dependency process. 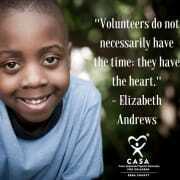 Through the use of highly trained volunteers, the CASA program seeks to provide every child who needs an Advocate with a voice in the court process. CASA of Kern County is a nonprofit organization that matches caring volunteers with abused, abandoned, or neglected children. Through advocacy volunteers are role models who provide consistency and give the children a voice in court. The unique one-on-one relationship that forms between the volunteer and dependent child is often the only stable, positive relationship the child has. In a sea of social workers, attorneys, therapists and caregivers, it's the court appointed volunteer who is a consistent and caring friend and advocate for the child. Our volunteers and staff are every day heroes who have the passion and commitment to positively influence the lives of these very special kids - one child at a time. Would you recommend CASA of Kern County?